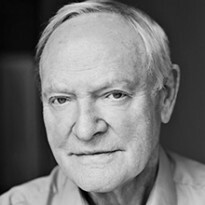 Julian Glover trained at RADA, and has had a rich and illustrious stage career. His relationship with the Royal Shakespeare Company dates back to the 1950’s and he has appeared there on many occasions. Productions have included Coriolanus, Henry VI: Parts 1, 2, & 3, The Man of Mode, Subject to Fits, Cousin Vladimir, The Changeling, Julius Caesar, Romeo and Juliet, and the title role in Henry IV: Parts 1 & 2 which earned him the Laurence Olivier Award for Best Actor in 1993. His work at the Old Vic Theatre includes Richard II, The Soldier’s Tale, Hamlet and Prayers of Sherkin. At the National he has appeared in The Voysey Inheritance, Chips with Everything and Jumpers. His West End credits include The Dresser, Macbeth, A Penny for a Song, Phaedre/Britannicus, Waiting for Godot, An Inspector Calls, Cyrano de Bergerac, Never the Sinner, Otherwise Engaged and The Constant Couple. His extensive film credits include The Young Victoria, Mirrors, Troy, Harry Potter and The Chamber of Secrets, Indiana Jones and the Last Crusade, Cry Freedom, Heat and Dust, Star Wars: The Empire Strikes Back, For Your Eyes Only, Ivanhoe, Quartermass and the Pit and Tom Jones. He has appeared in countless television series. Most recent credits include Game of Thrones for HBO currently showing on Sky Atlantic, Silent Witness, Trial and Retribution, Waking the Dead and Midsomer Murders. He has also starred in many timeless classics including Dr Who, Z Cars, Bergerac, Lovejoy and Taggart.